A single-bedroom house with the ground floor as a painter's studio. 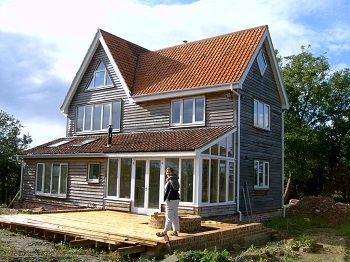 We designed a small L shaped plan with traditional Suffolk proportions. The ground floor is an open plan, oriented to the view of a pond that is the inspiration of the artis't work. Above, a living space open to the pitched roof like a small chapel. 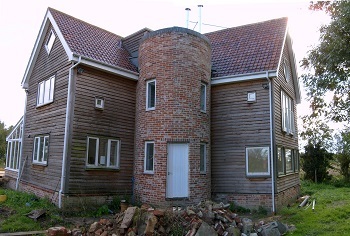 The round brick tower is built of bricks reclaimed from the cottages that were on the site. 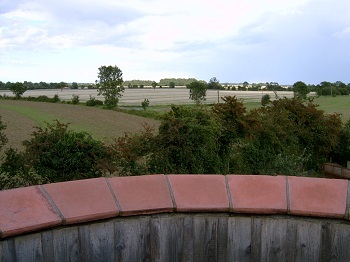 It contains an entrance lobby and bathroom and offers panoramic views from its roof. provide most of the space heating. 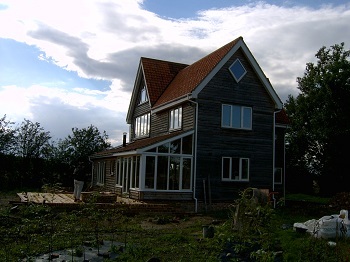 Construction was managed by the Client, using local trades. Completed in 2002.